The Dow Jones Industrial Average (DJINDICES: ^DJI) has traded at or near record highs throughout the presidency of Donald Trump. That has spurred frequent comments from the White House about the stock market&apos;s approval of the administration. 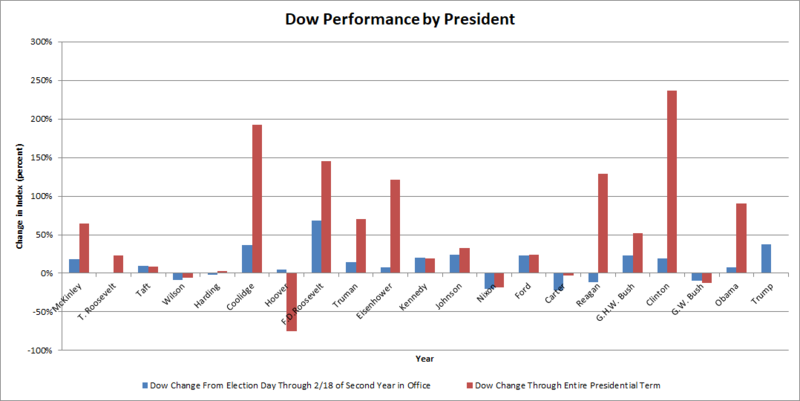 Going back to 1896, the Dow has risen in the first 15 months after a new president&apos;s election on 15 out of 21 occasions. The gains have ranged from Theodore Roosevelt&apos;s modest 0.1% increase to Franklin D. Roosevelt&apos;s 68% jump. By this measure, President Trump ranks No. 2, with a 37.6% rise that just edges out Calvin Coolidge&apos;s 36.1% gain. It&apos;s far too early to tell how the Trump administration will fare throughout the extent of his presidency. Historically, though, early success has tended to carry through to the end of a president&apos;s stay in the White House.